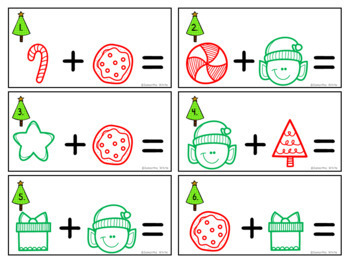 Looking for a fun way to practice addition with sums to 20? This download includes 4 sets of task cards to keep your students actively engaged while practicing addition. 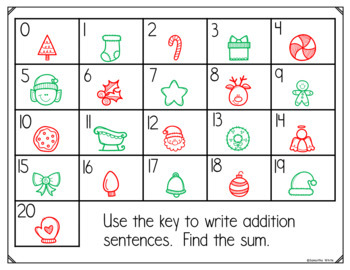 Provide students with the key by printing or displaying on the board and watch them have fun while adding! These task cards are a wonderful tool for independent practice, Kagan activities, early finishers, centers, and even assessments. 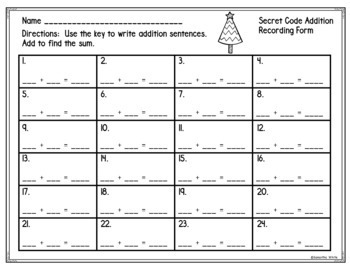 Another fun way to use these cards is to put them around the room (on desks, tables, shelves, counters, stick them to the walls, doors, cabinets), give them a clipboard, and have them “Work the Room” moving from card to card (in no particular order) recording their answers on the recording forms. This is a great way to get them up and moving! The cards, recording forms, answer keys, and title cards have a matching picture for easy organization. Please click on the PREVIEW button to take a look at samples included in this download. Thanks so much!! 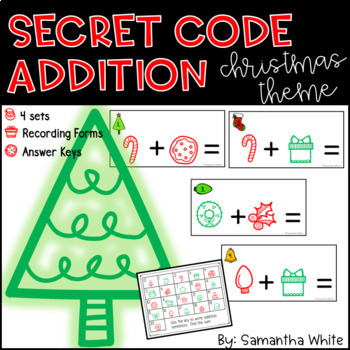 If you like this product, you may be interested in my Secret Code Addition Fall Theme! Go to your My Purchases page. You will see a Provide Feedback button beside each purchase. Click that button and you will be taken to a page where you can leave ratings and a comment about the product. Each time you provide feedback, you’ll earn TPT credits that can be applied to future purchases! Your feedback is valuable to sellers as well as other buyers. If you do find errors, please contact me before leaving a rating so I can make corrections. My goal is to please my customers!